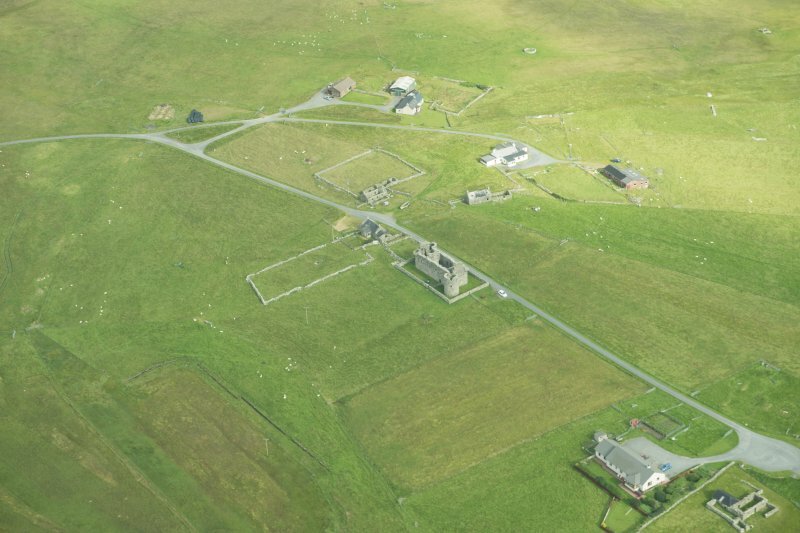 Oblique aerial view of Muness Castle, Unst, looking N.
General oblique aerial view of Muness Castle, Unst, looking N.
Oblique aerial view of Muness Castle, Unst, looking W.
Detail of panel and inscription. 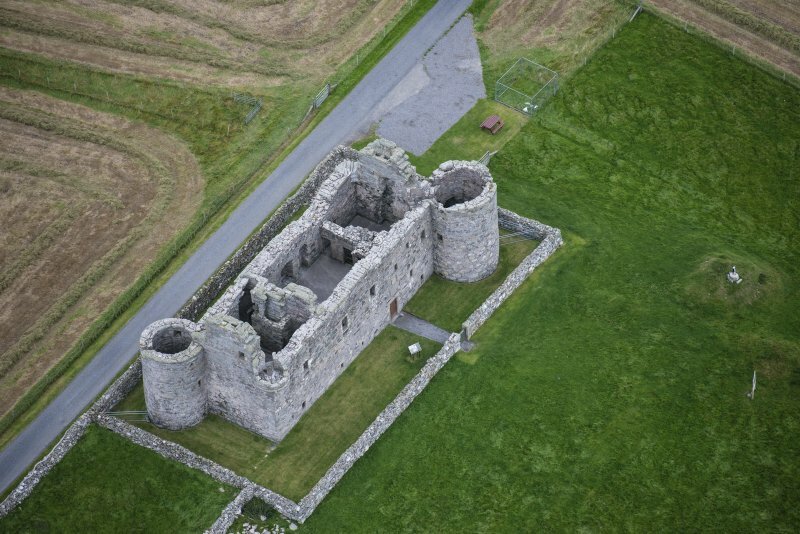 Muness Castle, Unst. 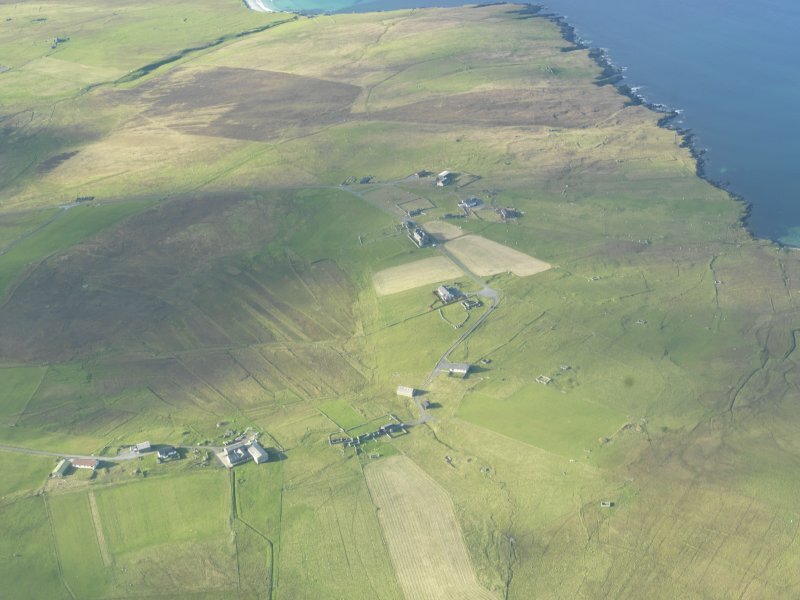 View from South. 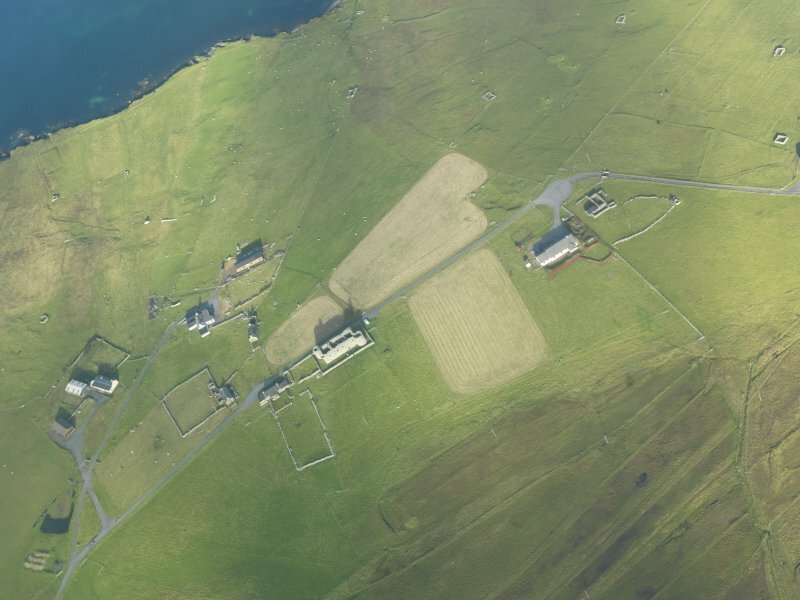 General oblique aerial view of Muness Castle, Unst, looking NE. 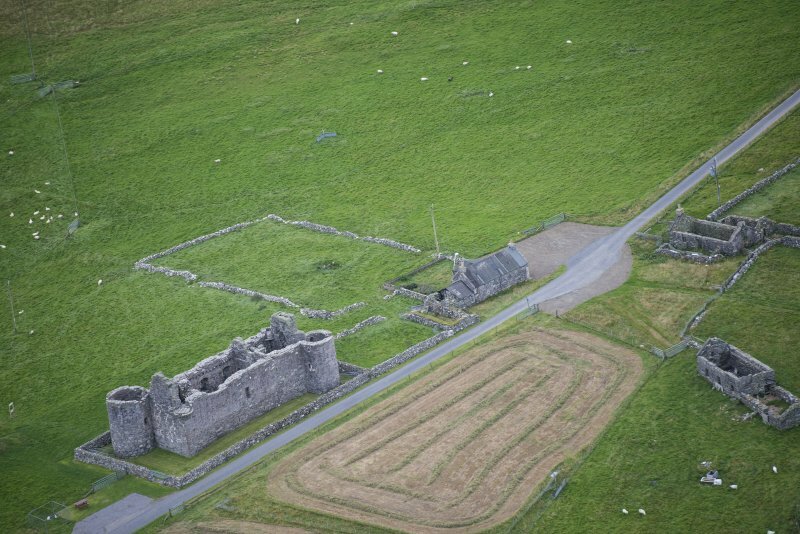 Oblique aerial view centred on the remains of Muness Castle with a mound adjacent, taken from the South. 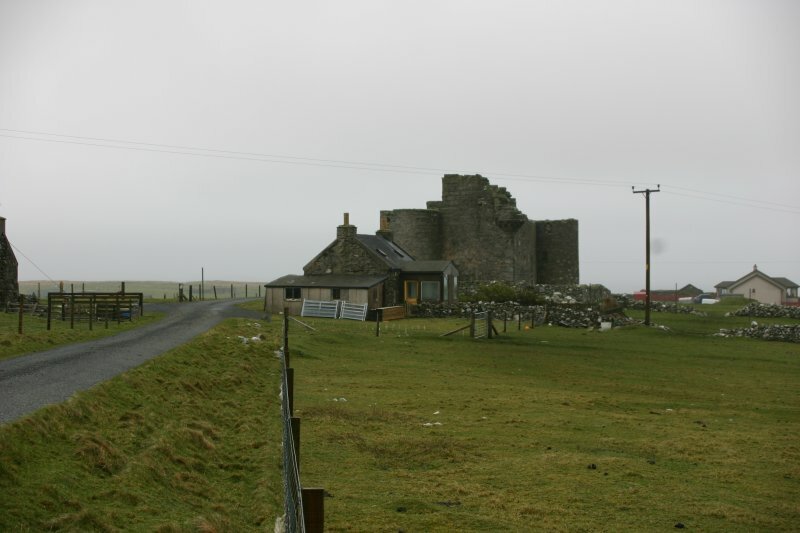 (HP 6295 0118) Muness Castle (NR) (In Ruins). 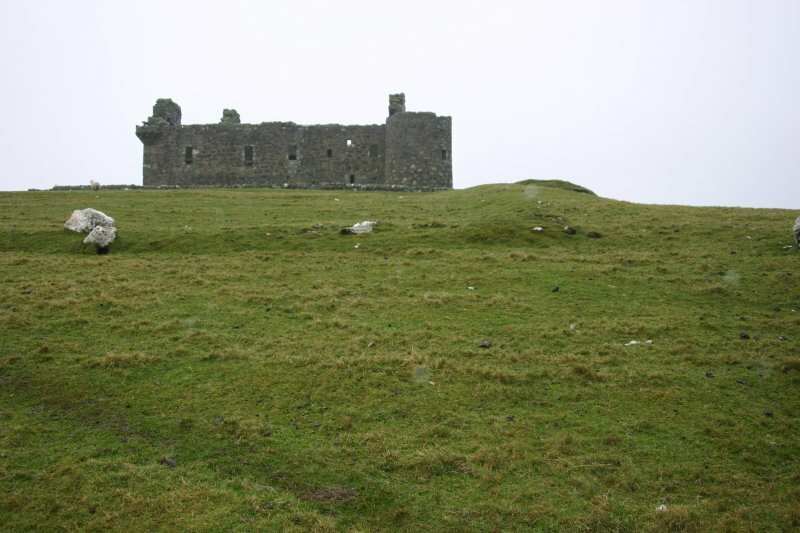 The erection of Muness Castle began in 1598. 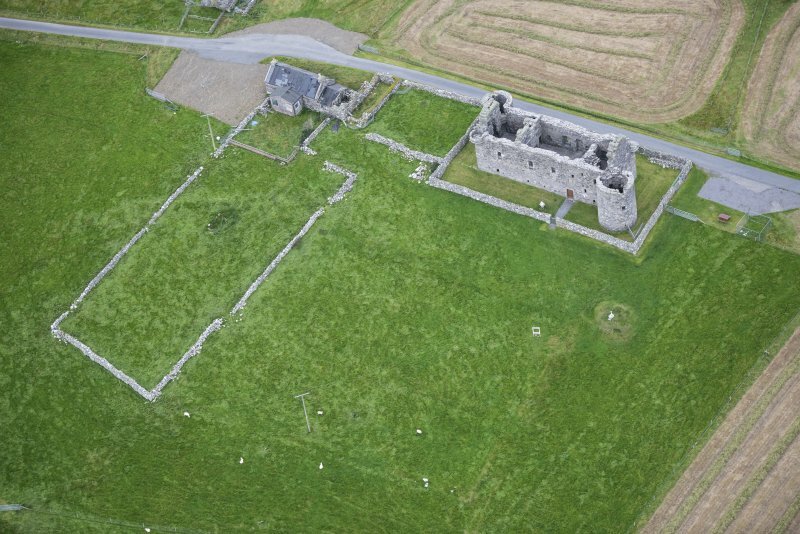 It was burned in August 1627 and whether the castle was ever repaired is doubtful. 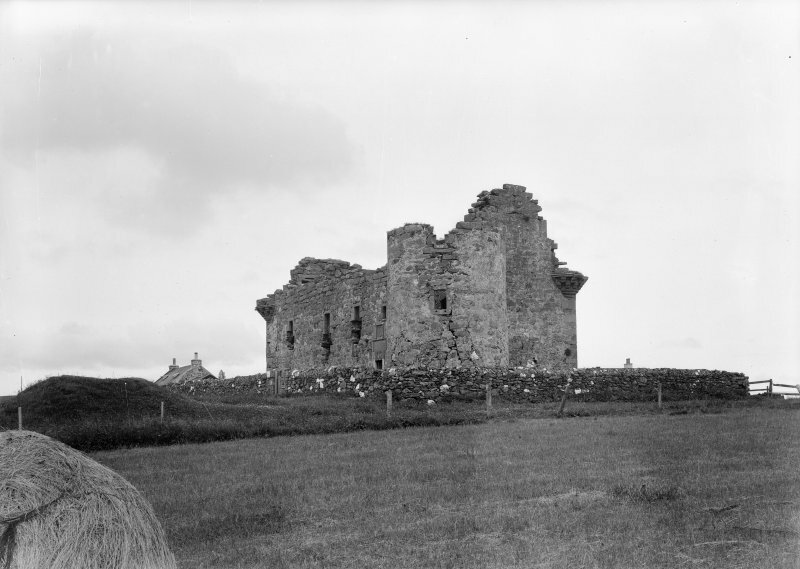 (W D Simpson) It is structurally complete, apart from its uppermost storey, which was almost entirely removed many years ago to provide material for the present enclosing wall. 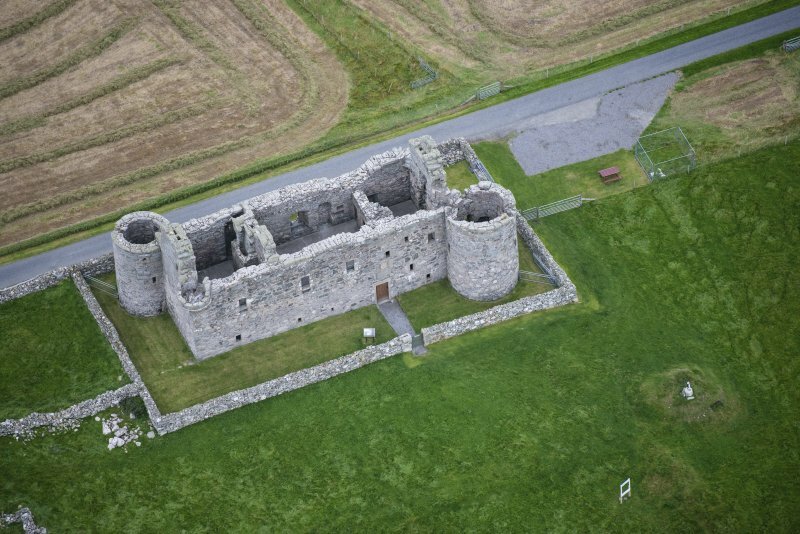 On plan it is an oblong block 73' 3" long by 26' broad, lying NW - SE, and having a circular tower attached to each of the N and S corners, as well as turrets corbelled out from the remaining corners at the level of the third storey. 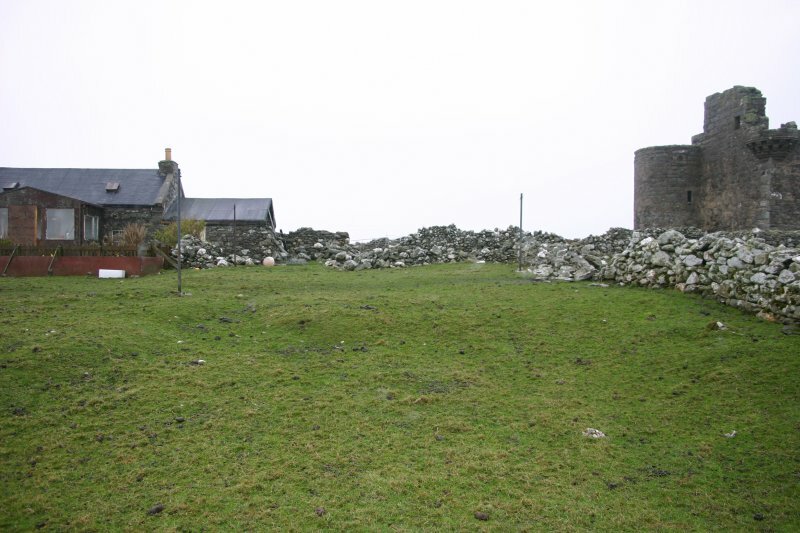 The masonry which is of local rubble is harled but has exposed dressings of freestone. 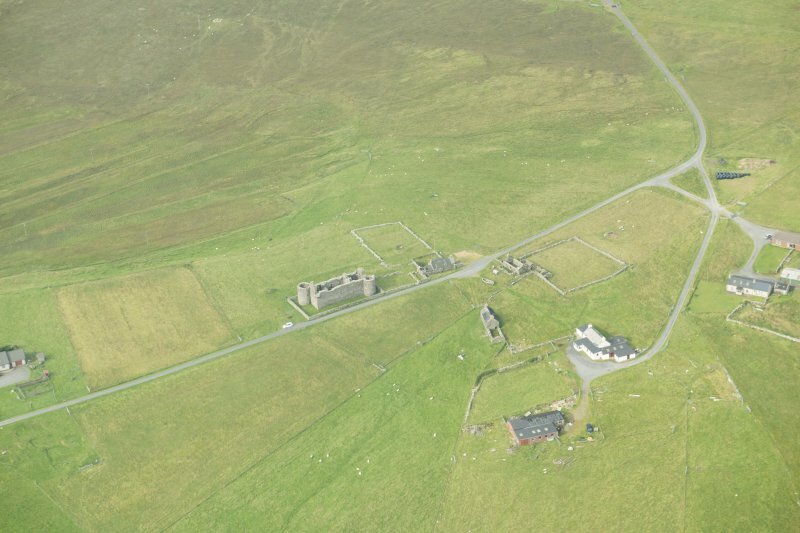 W B Armstrong 1881; RCAHMS 1946. 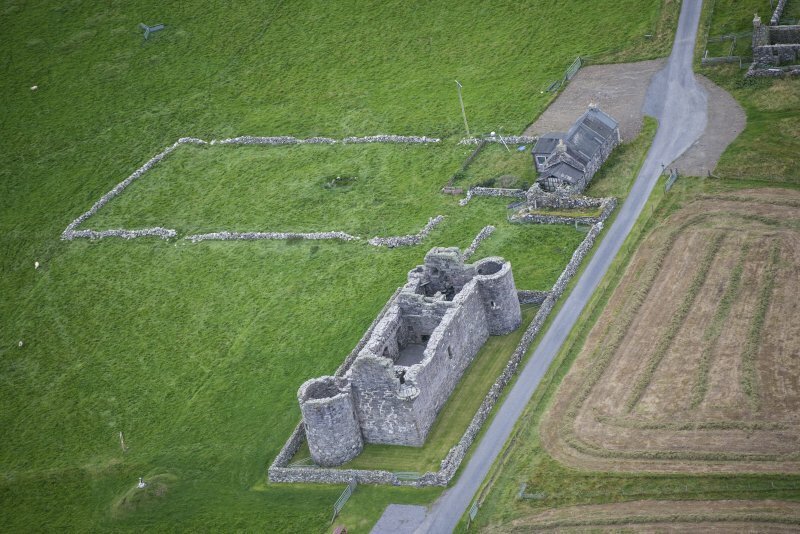 Muness Castle, as described and planned. 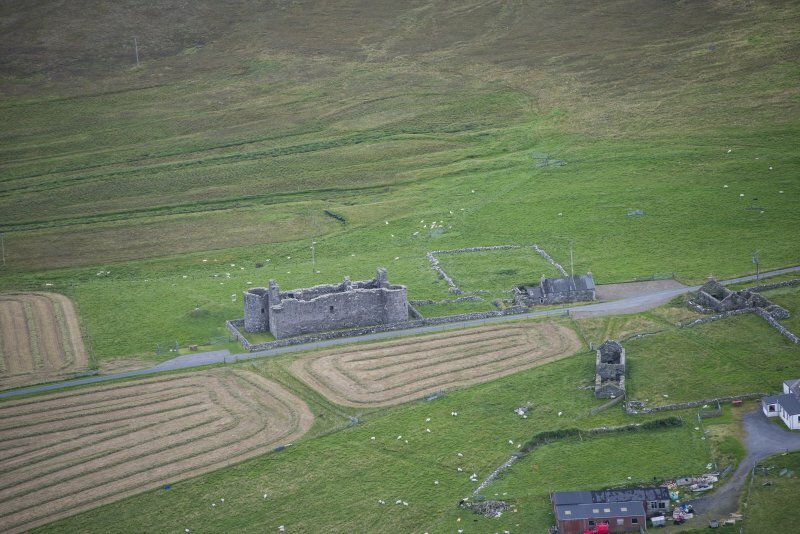 Visited by OS (RL) 2 May 1969.
by W. Cameron, of Mouness Castle. 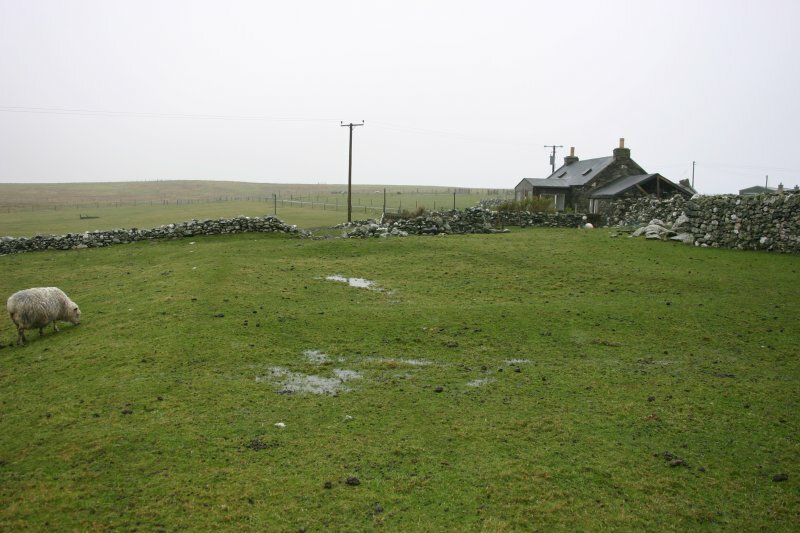 walls are faced with a fine freestone, probably from Orkney. To help, and not to hurt this work alwayis"
past winter have accelarated its destruction". 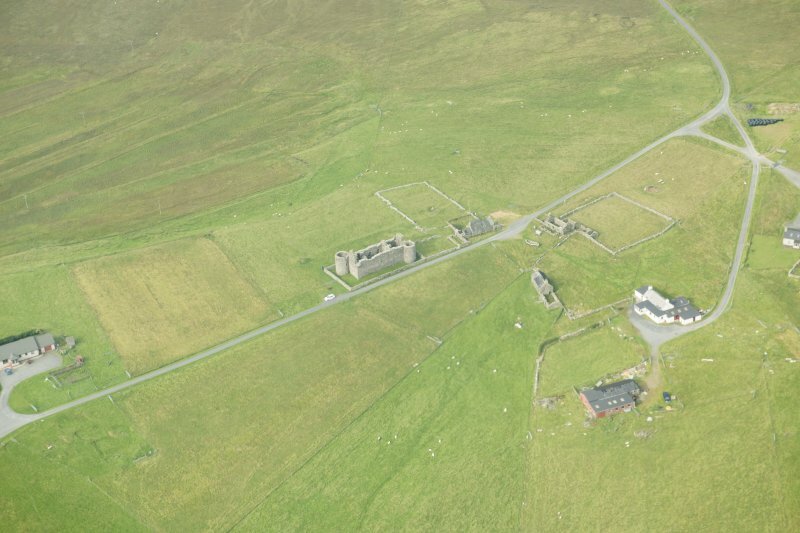 David Macgibbon and Thomas Ross, in "The Castellated and Domestic Architecture of Scotland"
in the Island of Unst, near its SE extremity, and is the most Northerly edifice of its kind in these isles. They give the spelling of the name as above, and it appears on some maps. 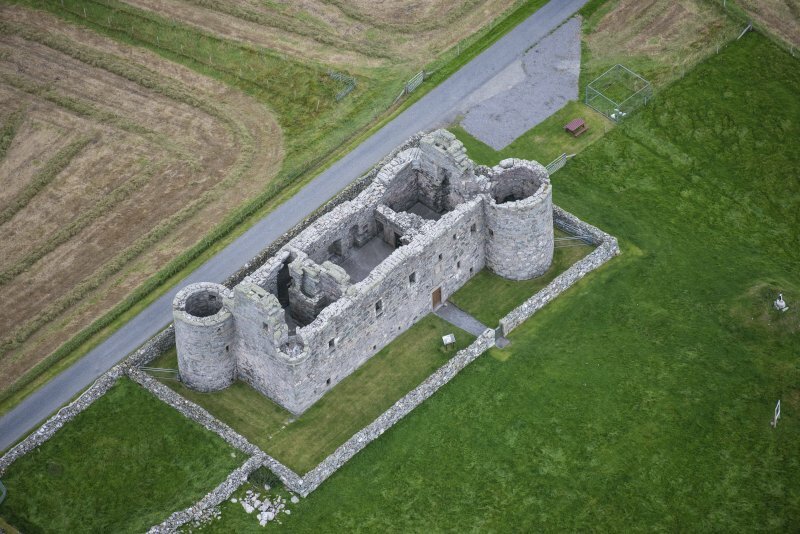 It is fitting that the most northerly castle in Britain should be an exceptionally fine architectural achievement. 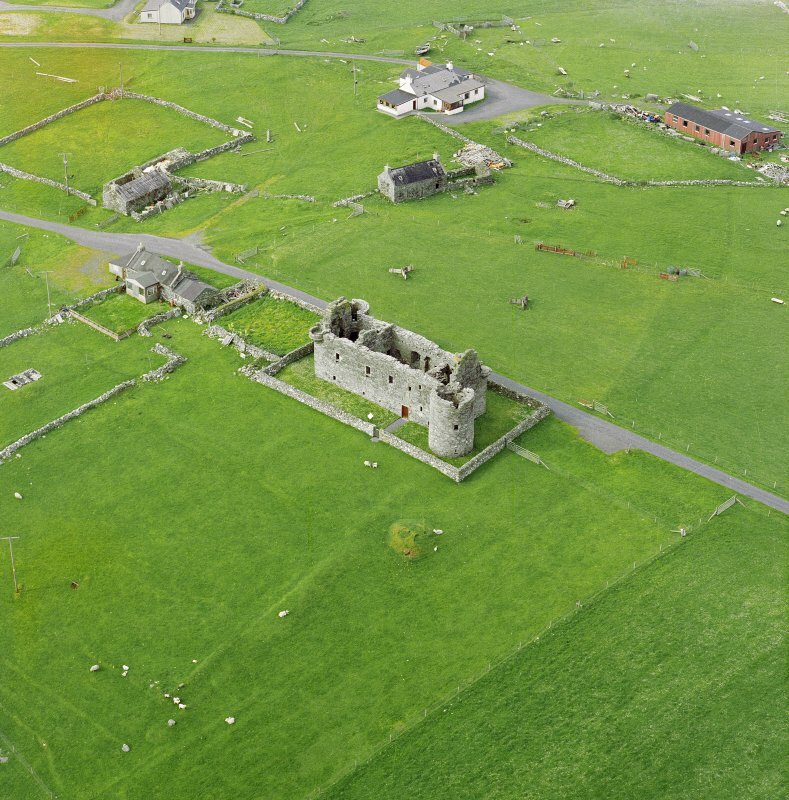 Muness is a small and beautifully proportioned defensive residence, compact and suited to a laird's family and yet up-to-date with contemporary fashion farther south as befitted its Scots laird, Laurence Bruce of Cultmalindie 111 Perthshire (colour photograph on p.44). 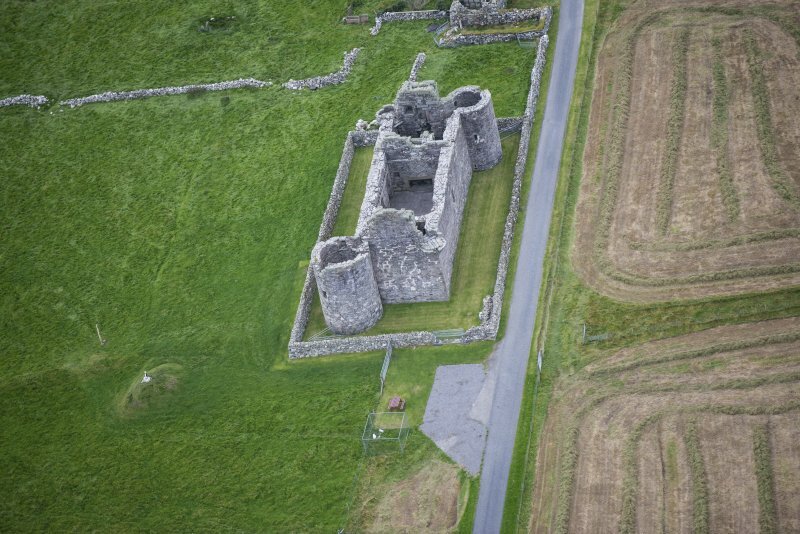 The castle consists of a long rectangular main block, 22.3m by 7.9m, with circular towers at the north and south corners (the south tower is slightly larger than the north). The ground floor and the first floor survive virtually intact, but the second floor and roof were demolished many years ago. 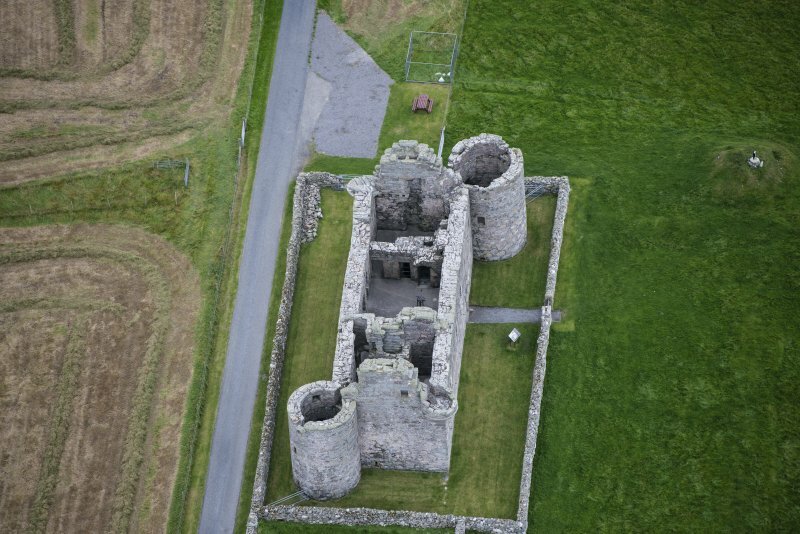 There were small turrets at the west and east corners of the missing upper floor, for the corbelling that supported them is still visible, adding a decorative note. 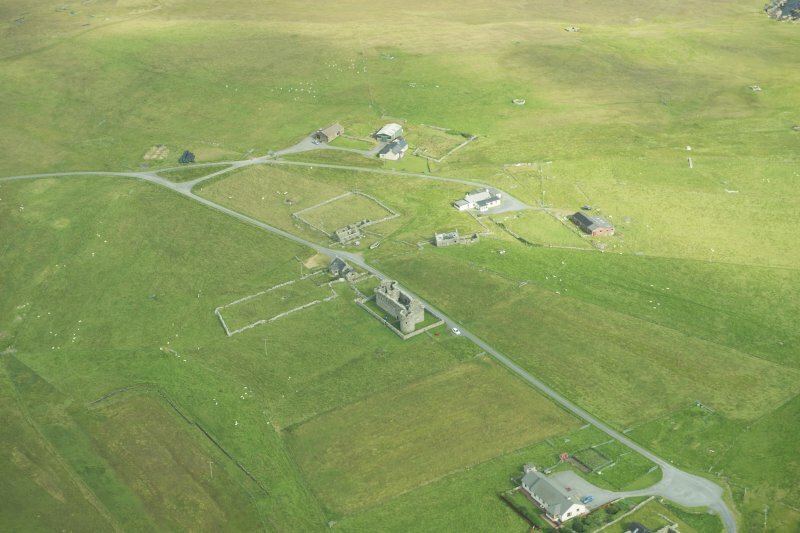 The roof over the main block is likely to have been gabled, with conical roofs on the towers. There is a pleasing variety of gun-loops from relatively plain to quatrefoil. The entrance is at ground-level on the southwest side of the building, covered by gunloops both in the main block and in the south-east tower. 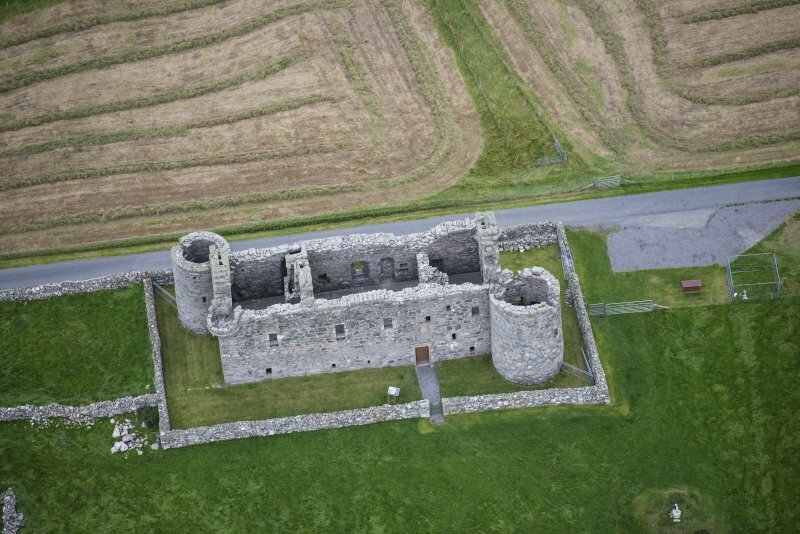 The door surround was brought here in 1959 from the old house at Lund, on the grounds that it may have been removed from the castle in the first place, but some architectural historians believe it to be work of the late 17th century rather than contemporary with the castle. 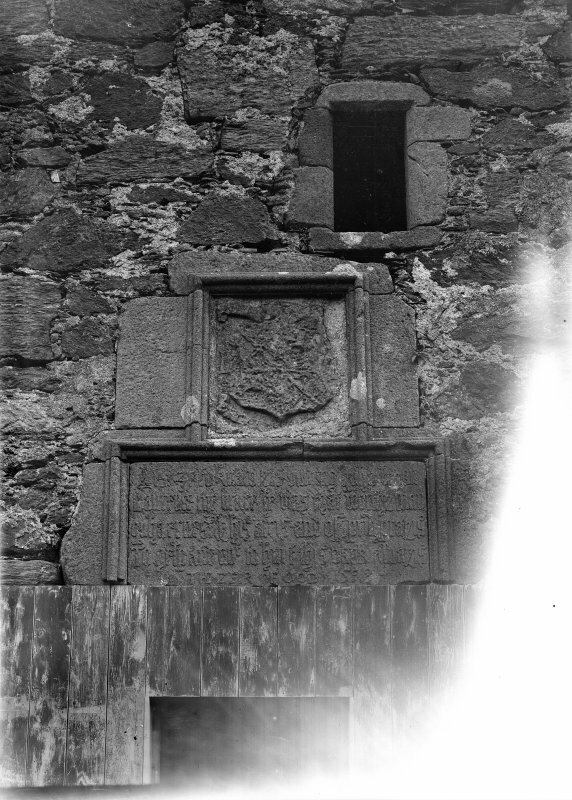 The original carved panels survive above the door, the upper with Bruce's arms and initials and the lower with an inscription about the building of the castle. To help and not to hurt this work always. The year of God 1598. 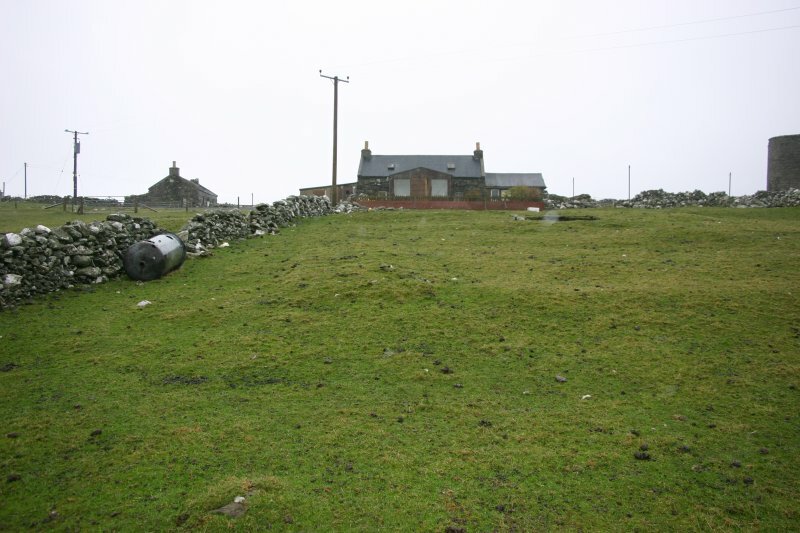 Muness was built not by a Shetlander but by a Scot, Laurence Bruce of Cultmalindie in Perthshire. 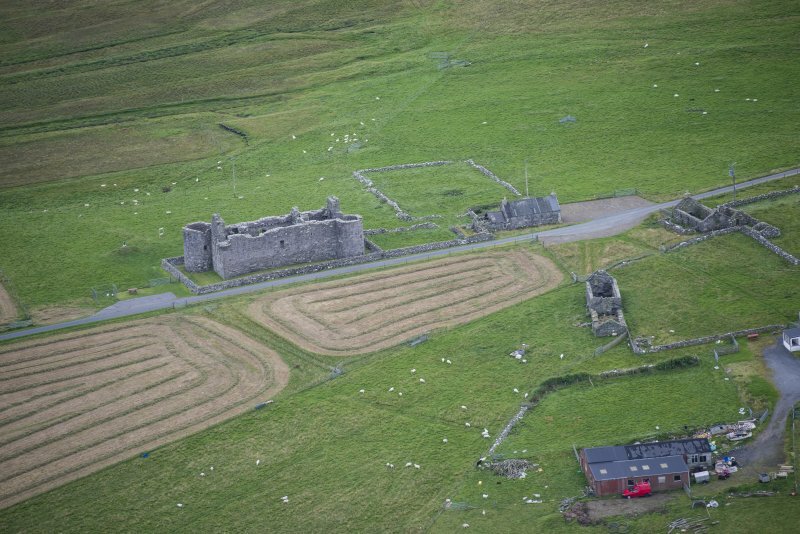 He was a half-brother of Earl Robert Stewart and through him acquired lands in Unst and the means to build a fine castle there. 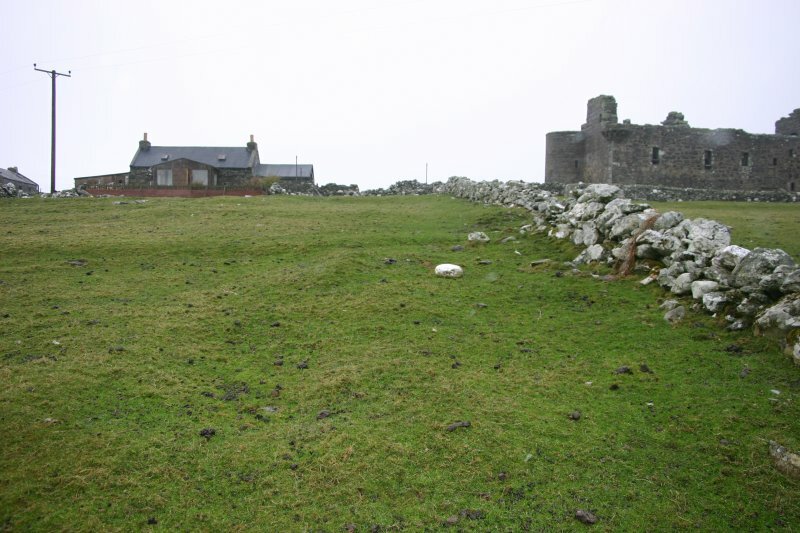 Muness would have been a very comfortable residence, furnished with rugs and tapestries and probably gaily painted ceilings. 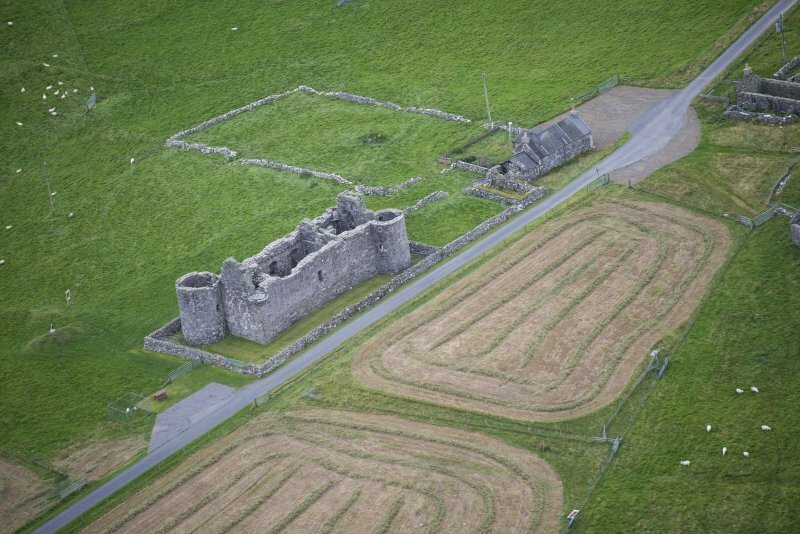 There are traces in the ground south of the castle of outbuildings and possibly terraced gardens. 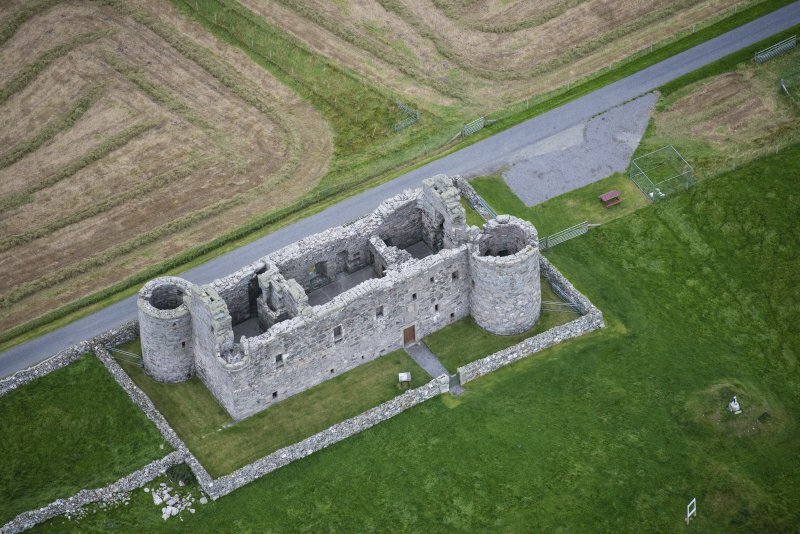 Inside the castle, the ground floor contains three storerooms and a large kitchen, all with vaulted stone ceilings, as well as a small room in each tower. The kitchen has a huge fireplace, with a circular oven for baking bread, and a sink in one corner. On the first floor, reached by a spacious stairway, there is a large hall with a fireplace (and a small alcove in the side of the fireplace where the salt could be kept dry). It is also served by a spiral stair from the storeroom, probably the wine cellar, below. 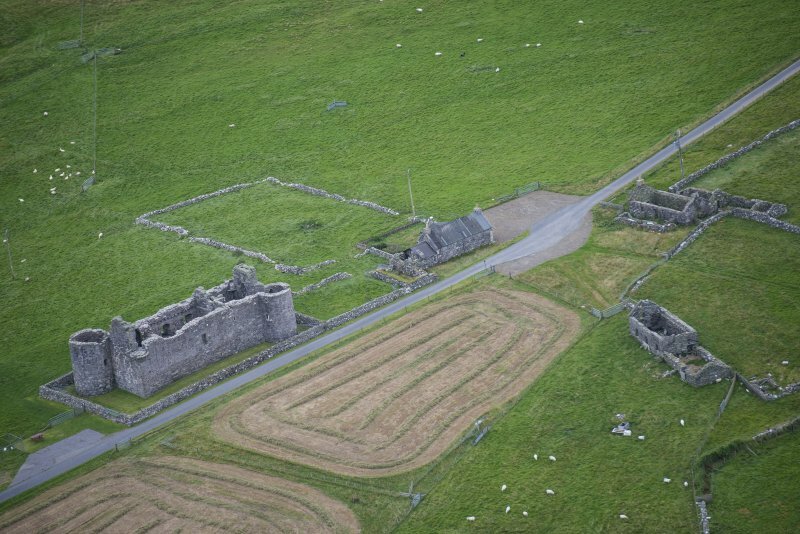 Chambers at either end have fireplaces in the gable walls, and the larger north-west room was probably the laird's private quarters, with its own little stair to the bedchamber above. The towers provided spacious closets. There were also three rooms on the second floor. 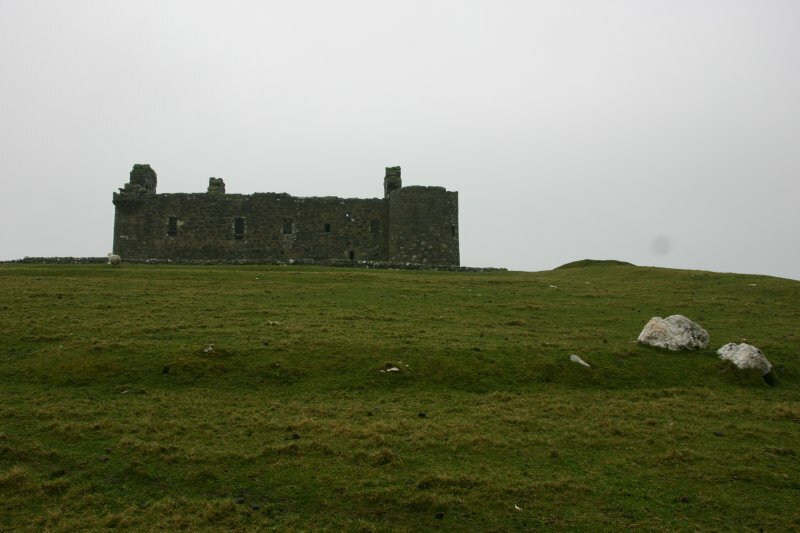 Laurence Bruce gave the castle to his second son, Andrew, in 1617. 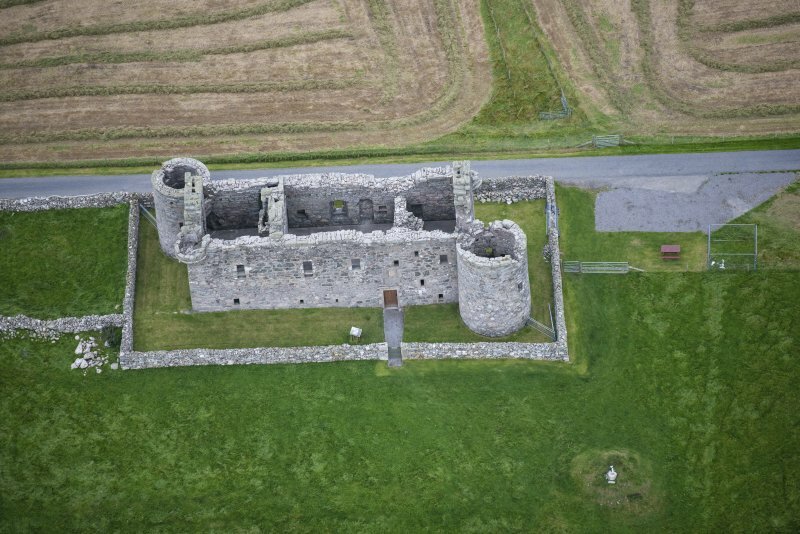 It was attacked and burned by foreign privateers in 1627, less than decades after building began, and this splendid residence was never the same again. 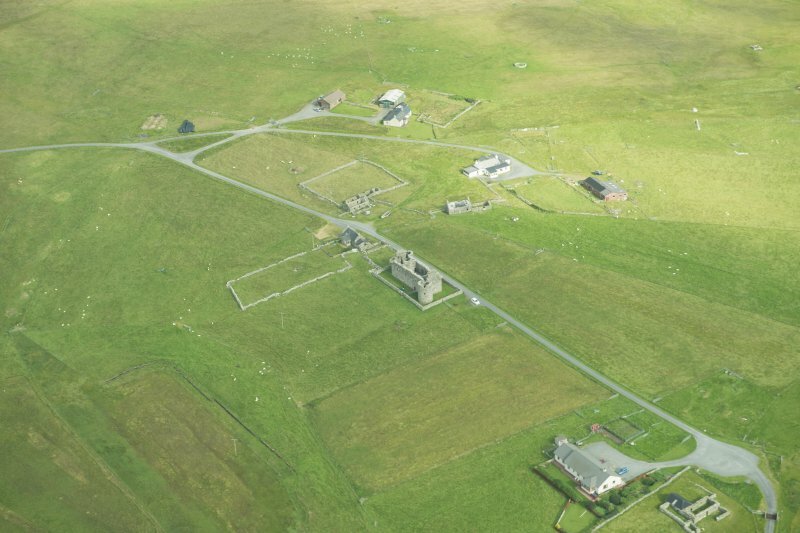 It was uninhabited before the end of the century, and the Bruce family sold it in 1718. 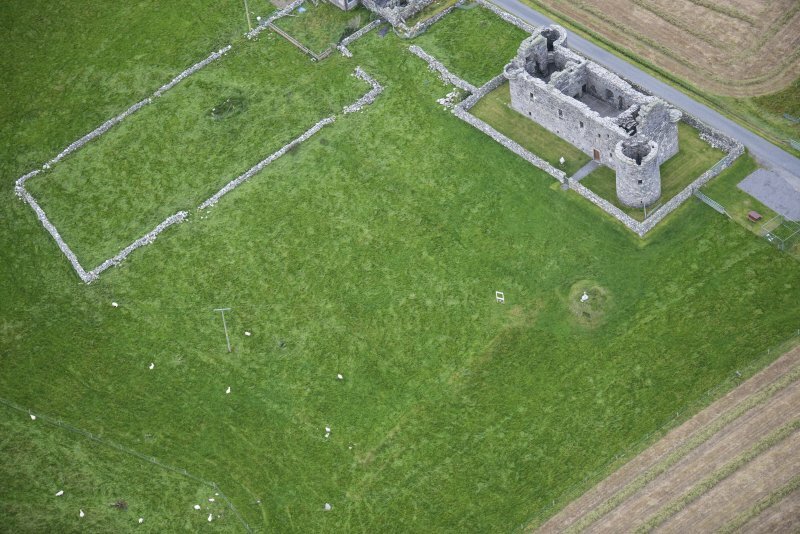 The remains of what may be formal garden have been recorded on oblique aerial photographs (RCAHMSAP 2003), comprising a rectilinear enclosure with internal rectilinear subdivisions defined by low banks lying to the SW of the castle.